Maria Lokken | What’s Above and Below The Line? What’s Above and Below The Line? 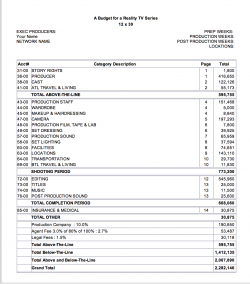 Reality TV budgets are created using budgeting software. The two most used are Movie Magic Budgeting and Showbiz. Either one will do the trick. 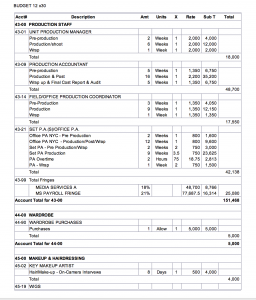 When your budget is printed you’ll have a one-page summary known as a “top sheet” followed by the detailed line-by-line budget. 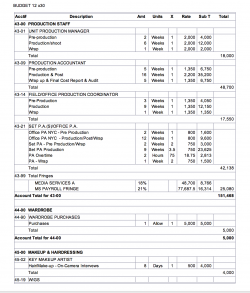 The top sheet delineates what is an above-the-line cost and a below-the-line cost. Above-the-line includes all the creative costs and creative personnel. These are the costs associated with purchasing story rights, clearing the title, paying the writers, the director, the producers, the cast, and the expense to travel your producer, director and cast. Below-the-line costs refer to the physical production expenses. This portion of the budget includes everyone working on the production, the equipment, the locations and the editing. These line items include, the Director of Photography, Production Manager, Art Director, cameras, lights, Editors, edit equipment, music, etc. etc. How did it come about that a distinction was needed between “above and below”? From what I could find, it began in the early days of film making with the big studios; 20th Century Fox, MGM, and Warner Bros. The studios had a stake in the creative aspects of the story rights, choosing the director, producers, and talent, so when they created their budgets they drew a line delineating their stake and it became known as above the line.